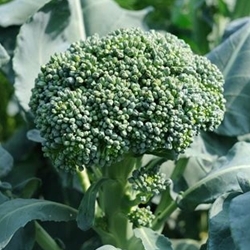 Broccoli is a cool season plant best grown in spring and fall. Broccoli heads should be harvested when buds are still tight. Regular harvesting encourages side spears to grow. Available in a four pack. All transplants are certified organic. Select here for transplant information, pick up and order dates. An excellent variety for home growers. Plant produces a compact blue green head about 3-4 inches wide then copious amount of side shoots for multiple harvests.